Hawaïan T-shirt & Hermès Sandals – Blog Mode Tendance et Lifestyle| Paris Beaauuu! Back from vacation in Greece (if you follow me on Instagram, you already know ^^), I’d like to introduce you to a new look that I’ve worn on vacation and that I’ve been wearing to work since I came back because this outfit is chic and easy to wear. I love the floral Hawaiian print, so when I saw this t-shirt at Isabel Marant (currently on sale), I get my hands on it. It also exists in black version but I find the white so cheerful for the summer, I love it! What to wear with? White of course! I opted for these white shorts, high waist and belted with the buckle tortoiseshell, which reminds me of the “Safari Chic” style, found just before going on vacation, at & Other Stories. = ^ .. ^ = Small personal note concerning these shorts, wear it only with a bag of light color or in a material which does not fear anything, in order to avoid any transfer of colors. Another purchase made before the holidays, the sandals. These are Hermes sandals. And instead of choosing the Oran, which we see at the feet of all Instagram girls, that I find for myself, not thin enough at the H, I fell in love with the Omaha who are absolutely goodess in orange and suede. Last detail of my outfit, the bag. 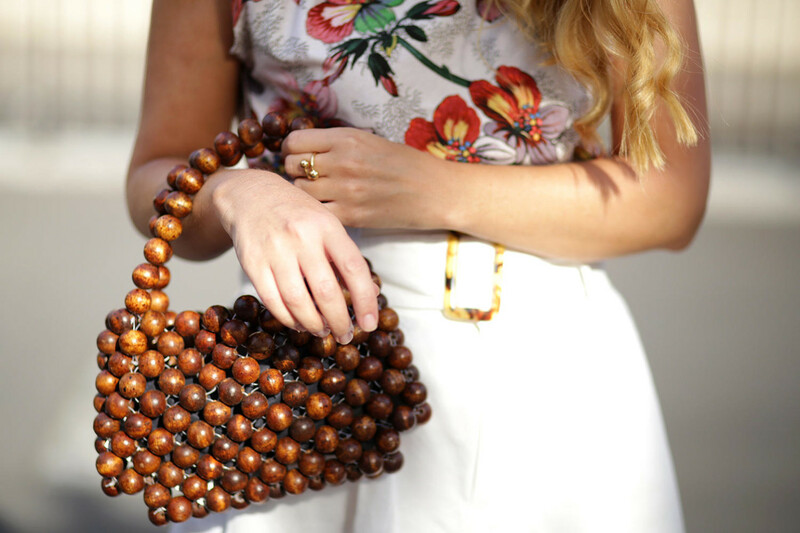 A cute little bag, made with big wooden beads, and which has just arrived in the new Mango collection. I hope this new outfit will inspire you. I’ll be back soon with new post about Greece. Previous Post Polka Dot Pants : 2 Ways to Wear it!